Let Me Tell You About My Best Friend — Pepper B.
Ok, two best friends because I have this lip in two shades: Grrrl and O.G. Red. Finally, I feel like I may have found my soulmates. Not only are these shades my fave but they’re everything I want and need in a matte lip. It doesn’t require a base because it has shea butter, coconut oils and grapefruit peel oils in it to soften your lips and provide extra moisture (MAJOR KEY). Milk uses a special technology called Milk Melt that matches your body temp for an “instant glide and a second skin feel”. This formula feels so good on your lips from application through the whole night. When I use matte lips I almost feel like they’re a little gritty and ‘skip’ on the application, but because of all of those amazing oils and the shea butter, it was a smooth transition from stick to lip. It’s important to me that my matte formula doesn’t dry out my lips, especially during the winter months. This formula is very pigmented and is definitely an all-nighter. Even when it did start to fade, my lips were still held a subtle tint. I love that about this line, it fades with grace so I still feel confident throughout the night that I don’t have to constantly be reapplying. 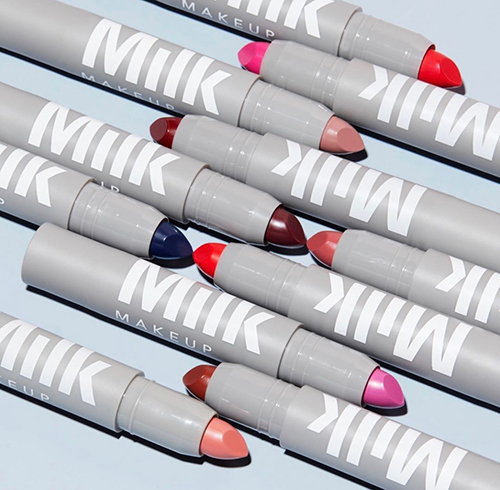 Grrrl by Milk Makeup Demi Matte Lipstick. I am always carrying the shade, Grrrl around with me because I think it goes with everything. It gives me a little bit of a 90’s vibe but I’m into it. It’s described as a ‘Deep Plum’ but to be honest I find it more in the mauve family with a hint of grey. I love it because I’m a huge fan of this shade I’ve been wearing it all winter and fall. And like the OG Red it stays on all night and the subtle tint is reliable until I can get into a mirror to reapply. O.G. Red is super pigmented and is now my go-to for when I want a fire engine red. It’s a litttttle messy, but what best friend isn’t? I’m always so careful when I apply this shade because it somehow gets on my chin and teeth (unfortunately) but I don’t really care to be honest because the shade is that dope. I wear some lipliner with this shade and it won’t feather around my lips, and even though it’s a little finicky to apply I really love this formula and shade overall.